Bread is a lot unhealthier than we think: two slices of whole wheat bread increases your blood sugar more than eating two tablespoons of pure sugar. This then triggers the release of insulin and the accumulation of abdominal fat. Over prolonged periods, it can even increase the risk of developing heart disease or cancer. Processed red meat is also extremely unhealthy. Eating processed red meat on a regular basis can increase the risk of heart disease and cancer. If you are offered complimentary bread with a meal, get a healthy alternative instead, or simply pass on it. Generally speaking, avoid bread as much as possible. 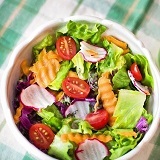 Replace it with healthier options such as lettuce or other greens. For example, eliminate bacon or hot dogs entirely from your diet. Try substituting them with vegetables, fish, nuts, or legumes. Pick one food you eat even though you know you shouldn’t, and give it an entertaining nickname. For example, let’s say you can’t seem to give up doughnuts, so you start calling them “deep-fried dough.” You will be stigmatizing the unhealthy food and will think twice before eating it. Learn the difference between organic and healthy. Organic foods are simply grown without modern chemicals and additives (e.g., pesticides). They can still be full of fat, sugar and carbohydrates that are bad for you. Don’t buy foods simply because they are labelled “organic”; study their nutritional label and examine what is actually in them. Eat whole fruits, not dried or juiced ones. Dried fruit or fruit juice does not contain many nutrients. It is much better to simply eat whole fruits. Start every meal with the most healthy item on your plate and end with the least healthy item. Eating the healthiest item in your plate first will give your body the opportunity to fill up on better foods before moving on to starches, carbs, or sugary desserts. Identify one specific risk to your health. Spend an hour studying what foods you could eat to decrease that risk—then eat those foods!